A key piece of advice for investors has traditionally been to diversify holdings to minimize risk and maximize returns. King Solomon knew the wisdom of this strategy too. Biblical accounts of Solomon’s reign as king of Israel reveal a man who didn’t hesitate to pour resources into connections with adjacent lands and allocated his resources both to building a temple for the glory of his God and a palace for himself. He was said to have 900 wives, too – another example of diversifying assets. In today’s investing world, diversifying isn’t limited to purchasing properties in different areas. It can also mean purchasing different kinds of properties. And in today’s expanding rental real estate market, both single-family housing and multi family complexes, or multiplexes, offer opportunities for investors to apply Jason Hartman’s recommendations to buy and hold income rental property for a long-term return. Both single-family homes and multifamily complexes (more handily referred to as multiplexes) can be good investments, but these two very different kinds of properties offer different challenges and opportunities. Because the housing crisis forced many homeowners out of their homes, these and certain other groups of renters, such as young families who hope to buy a house someday, are eager to rent a house, not an apartment. For investors, this means that tenant turnover is relatively low and only one tenant needs to be “managed” for the property. Single-family homes are easier to sell than multiplexes, and may appreciate faster in some markets. Since the foreclosure market is still busy with cases only now working their way through the courts, it’s relatively easy to purchase single-family homes at low interest rates to create the kind of diverse portfolio recommended by Jason Hartman. These properties are relatively easy to maintain over time. But a long-term vacancy can put a dent in your investment cash flow, and changes in the market can make putting all your investment eggs in one kind of basket particularly risky. Multifamily housing, or multiplexes, range from a house with a basement or second-floor suite to apartment houses with large numbers of tenants. But the true “apartment complex” comes under the heading of commercial real estate, and is a different kind of investment than smaller multiplexes made up of two, three or four units. 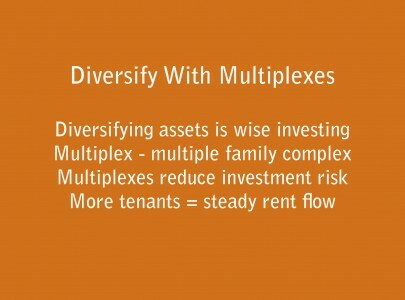 A key advantage to investing in multiplexes is that multiple tenants spread the risk – there’s less likelihood that all units will be vacant at once, and multiple families mean multiple rent checks. But multiplexes may not sell as easily as single-family homes, and create more demands in terms of upkeep and maintenance. Tenant disputes are more likely, too, with greater turnover since tenants are more transient. But these properties allow investors to diversify holdings and spread the risk fairly rapidly and may yield a greater long-term return. Single family home or multiplexs. Like King Solomon, who put his wealth into endeavors both at home and abroad, investors who can manage it may want to purchase both kinds of properties as part of an overall strategy based on Jason Hartman’s advice to diversify holdings for lower risk and greater return.